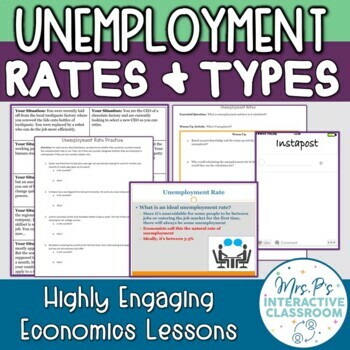 Unemployment Rate & Types Economics Lesson! Unemployment is one of my absolute favorite lessons to teach. After all, many students either have jobs or are looking for one- so this topic is one they’re already receptive to. And since my passion is student engagement, these lessons are jam packed with fun, interactive activities designed to make the content intriguing. This lesson will teach your students all about what unemployment is, how we calculate it, and the four main types. Each day will open with an engaging warm up activity, reflection, and then an interactive lecture (15 mins max). On day one, students will learn about unemployment and then practice identifying who gets counted in the unemployment rate and calculate it. Then, they will research the facts about unemployment benefits before diving into inferences about the unemployment rates in the US and their state over various periods of time. On day two, students will engage in a fun activity where they get an identity and determine whether they’re unemployed. They work as a team to figure out their own unemployment rate. Lastly, students will create social media posts (insta-post!) about the 4 types of unemployment. I usually teach this unemployment lesson in two 50 minute class periods.